My husband’s work schedule can vary widely. Some nights he’s home for dinner but sometimes he won’t hit the house until well after 9 or 10 pm. On nights like that, he’s on his own for the evening meal. If he’s got a particularly grueling day ahead, I might pack something for him that he can heat up, because it’s nice to eat something warm for your last meal of the day, but sometimes my day is crazy too or I’m just not organized enough, so he’s in sandwich territory. Nights like that also mean that *I* am on my own for dinner, and that can be problematic. The reason it’s problematic is because I’m a lazy slob, and if left to my own devices, I will happily scarf down half a block of Dutch gouda and a box of Triscuits and call it dinner. Or I’ll dig around the refrigerator and find any leftover on the verge of spoiling and make do, since I can’t be bothered to fix anything decent if it’s just me. I can also make a meal out of a big bowl of buttered rice and a sliced tomato. Not the most balanced of repasts. You’d think that after 40-plus years, I’d have a little more self respect than that, but I guess that’s just the way I work. I’m trying to do a little better. When summer is in full swing, I have better luck, because I always have sweet corn around and everybody knows that several ears of sweet corn, slathered in butter and salt, washed down with a glass of cold rose wine, is the perfect summer dinner. Alas, it’s not summer yet. I have a few months of scrounging around left before sweet corn season. Luckily for me (and for you), this spring, I discovered socca. What the Hell is socca? Glad you asked. 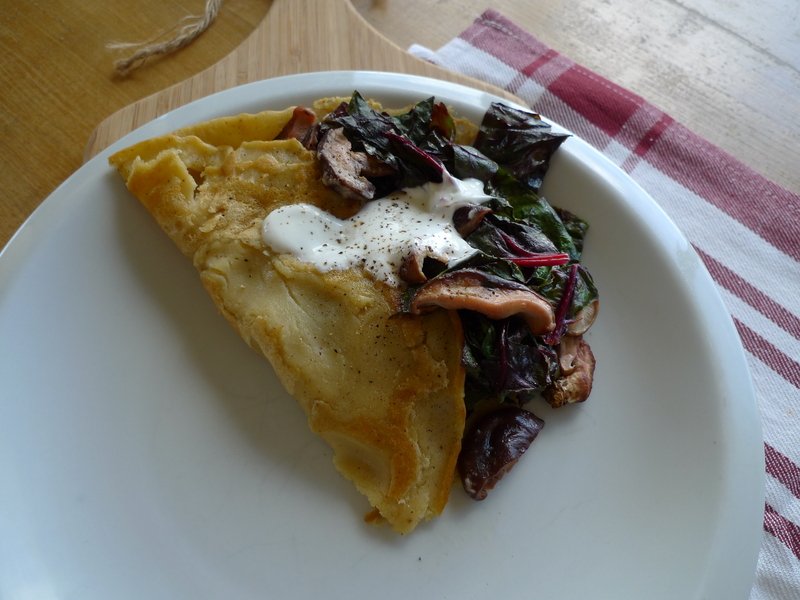 Socca is a pancake of sorts, made with chickpea flour, popular in Nice, France. 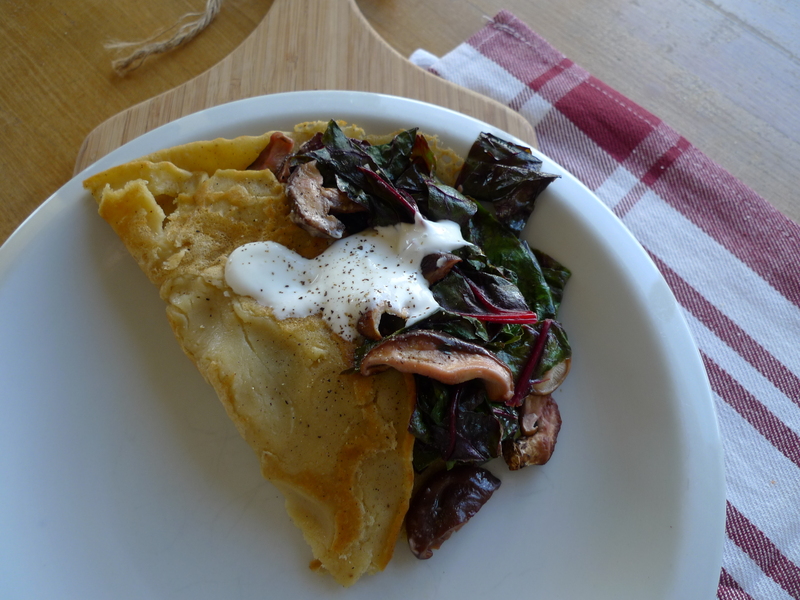 When I first came across a recipe for it, I thought, “This sounds weird.” A savory pancake? Chickpea flour? I’d never seen chickpea flour before, but then I remembered that I live in Boulder county, where gluten is the undisputed enemy against humanity. I toddled off to the local Sprouts supermarket and sure enough, there it was. My main impetus for trying socca (besides the obvious allure of it sounding “weird”) was that it sounded kind of like dosa, an Indian crepe-like delicacy made with ground lentils that is incredibly complicated and beyond my realm but so damn delicious. My husband adores dosa and my mother-in-law makes crazy good dosa, but I am not an accomplished Indian cook. I’ve seen her make dosa (even on the grill!) and it makes my head spin. But…if I can find an easy, sort of dosa-like substitute that I can pull together on a weeknight? I’m in. The only difficult thing about socca (besides buying chickpea flour) is that you have to let the batter rest for about 20 minutes before you cook it. Turns out, this isn’t that big a problem, because it gives you time to figure out what you want to stuff your socca with. Yep, you stuff socca. With delicious stuff. Like dosa, you can stuff socca with just about anything you have lolling about in your refrigerator. Leftover vegetables? Saute them up with some garlic and seasoning. An egg and a lone slice of bacon? Why not? Chopped tomato, leftover chicken and some cheese? Go for it. I have been diligently trying to eat my vegetables (swimsuit season, y’all. It’s coming.) so most often, that’s what I stuff my socca with, but do what makes you happy. My current favorite version consists of sauteed greens, onions and garlic, gussied up with a creamy yogurt drizzle. Sometimes I add mushrooms and peppers, and if I have a little slice of Canadian bacon hanging around, all the better. If I’m feeling racy, sometimes I add a sprinkle of fresh herbs or some toasted chopped nuts or sunflower seeds. See where I’m going, here? There really aren’t any rules. Okay, I lied. There are a couple of rules. 1. Don’t rush the batter. It does need to rest for at least 20 minutes. 2. If you make the yogurt sauce, use full-fat yogurt. You’re worth it and it makes a difference. 3. If you make more than one socca (you can double or triple or even quadruple the recipe), you have to serve each one immediately after cooking it. 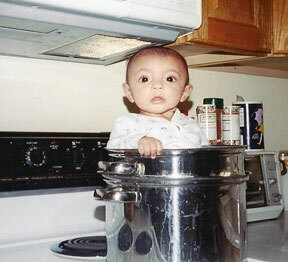 This means you will have to serve people individually and then return to the stove to make more. Like dosa, socca doesn’t sit. If you make it sit, it gets soggy and sad and mean. Don’t do it. Be organized enough so that you can scarf that socca hot off the griddle. Whisk together the chickpea flour and the cashew milk. Set aside and let it rest for about 20-30 minutes. After the batter has rested, stir in the beaten eggs and the seasonings. -wash and cut out the tough stems of a buttload of leafy greens (at least once bunch of Swiss chard or kale or about 3 cups baby spinach). Tear into pieces and pat dry. When hot, add the sliced onion, turn down the heat to medium and saute until onion is soft and beginning to brown. Add the garlic and cook for a minute. Add the greens by handfuls, stirring, until they wilt enough to add more to the pan. Continue until all greens are wilted. Warm about 2 teaspoons butter, coconut oil or ghee in a 10-inch, cast-iron skillet over medium heat. Pour in the chickpea batter, coating the pan evenly. Cook for 2-3 minutes, or until nearly set (small bubbles will form). Slide socca onto a plate, top with a scoop of sauteed greens, drizzle with yogurt sauce and serve immediately. I sometimes like to sprinkle some sunflower seeds over the top for crunch. **If you are an unconfident flipper, don’t worry. Your socca might look a little mangled but it will still taste delicious. Tagged as: easy vegetarian meals, how to get more greens in your belly, socca recipe, what the Hell is socca? Next post: School’s (almost) Out!